The FTP Push Task allows a process to transfer a file generated from one of the PDF Task Types, or directly from a File Attachment question from a form to an FTP server. There are options that allow a user to select a directory on the FTP server to upload the file to, or, alternatively, the task can be executed by the system in the background without any user interaction within the process. 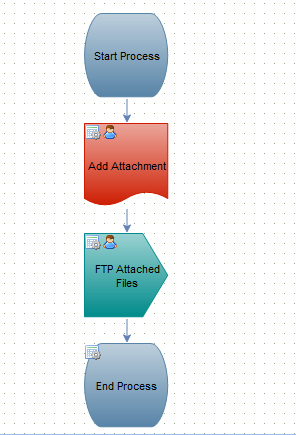 Here, we have added the FTP Push task type to the process and gave it the name 'FTP Attached Files'. Next, we need to select 'Configure Task' from the pop-out menu of the task. File to Send A file attachment question within your process flow or a PDF generated by a PDF task type. Yes This assigns the file that will be uploaded to the FTP server. The drop-down list will automatically be populated with valid options from within your process. Allow end user to pick directory Checkbox Yes If the FTP recipient is a user, and the Checkbox is selected here, the recipient will be presented with a dialogue to choose which directory on the FTP server the file should be transferred to. If this is unchecked, and the FTP task recipient is a user, the dialog displayed will simply have an OK button to confirm upload. If the recipient of the FTP is not a user, this option has no effect, and the the file will be uploaded by the system to the value entered into the Destination FTP site. In an example, a user uploads the brochure to be approved via the Brochure submission form, and it is sent to the Manager Approval task. Once the Manager approves the document submission, the FTP task is initialized. Since we have assigned to the FTP task to the requester, and the Allow end user to pick directory is set to Yes in our configuration, the user is presented with a series of dialog boxes. In the first window Loading folders... , Integrify is reading the directory structure from the FTP server. Once it has read the structure, the display will change to Please select folder. At this point, the user can select which directory on the server to upload the file to. In our example, the user selects the PDFUpload folder from the drop-down list, and clicks OK. While the FTP Task transfers the file to the FTP server, a dialog displays Posting... and will complete the task once the upload is complete.